“So, there I was, knee-deep in hand grenade pins” is the way every good tale (lie) started out when I was in Special Forces. Today I ran into a doozy. I found a website that publishes utter and absolute BS. I even have a name and, now, verification that they completely fabricated another story. This picture originally appeared on CNN.com, but don’t look for attribution at YourNewsWire. 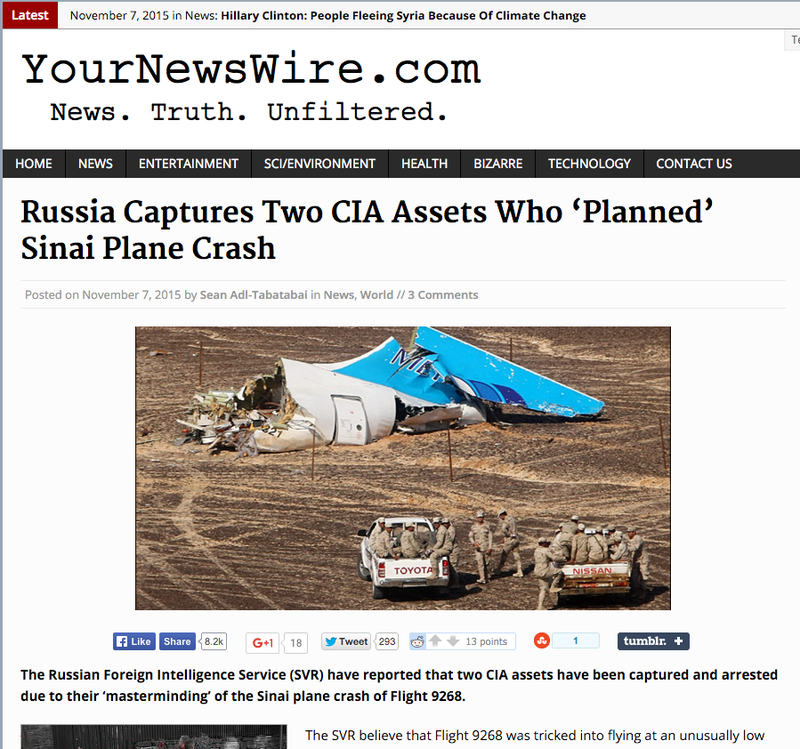 Remember the blog that I published: “Complete BS – Russia Captures Two CIA Assets Who ‘Planned’ Sinai Plane Crash“? I put the source at the bottom: “Source: http://yournewswire.com/russia-captures-two-cia-assets-who-planned-sinai-plane-crash/“. I never heard of YourNewsWire before, so I took a look. YourNewsWire.com. “News. Truth. Unfiltered.” That, alone, is how most Russian proxy “news” sites tend to advertise themselves. Throw in “Alternate News” and I would have had an immediate lock. I read the story and found it interesting, except that I can’t imagine shoving a VIP into a midget submarine for a long and arduous trip to Argentina. My BS detector began really vibrating. “But they have a picture, so it’s gotta be true!” I’ve heard and read that statement all too often, so I thought, let’s check this out. 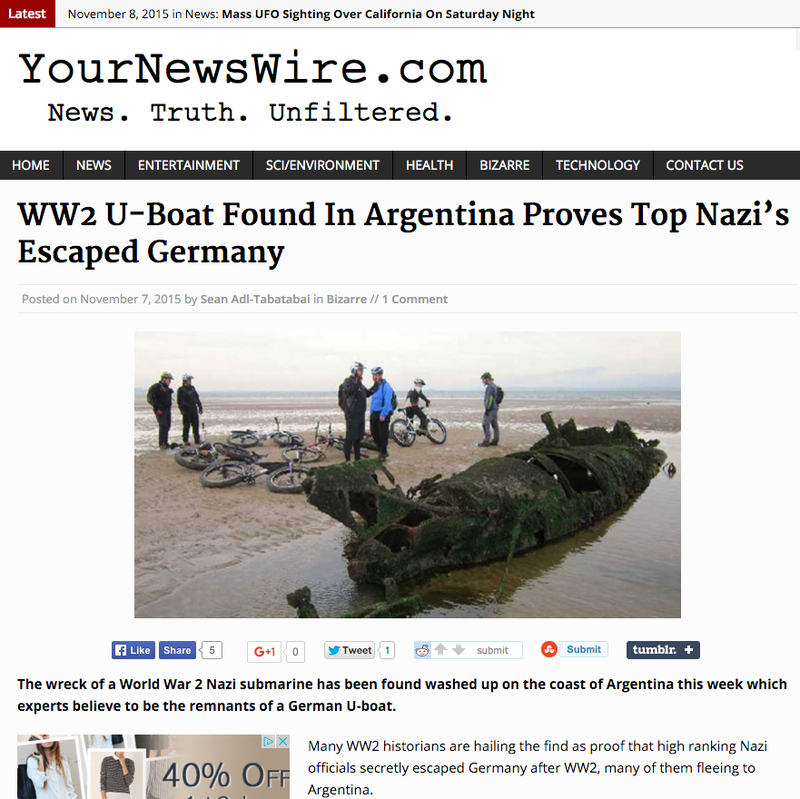 I took the URL of the picture, http://cdns.yournewswire.com/wp-content/uploads/2015/11/Nazi-Uboat-Argentina.jpg and searched for the picture. I was led to a neat blog called “Coastrider”, about bicycling in Scotland. I found this nice little blog: “A Saturday Cycle to the Sub Wrecks at Aberlady Bay“. There it was, the same picture, complete with bikers, dated 5 January 2013. Just to verify, I found this reference to Aderlady Bay, and a picture of the same wreck from a different angle. The wreck has been there since just after World War 2. The midget submarines are XT-Craft, training versions of the X-Craft that attacked the Tirpiz in 1942. 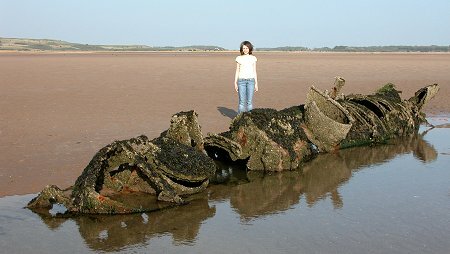 In 1946 two of these vessels were towed to Aberlady Bay and moored to a large concrete block, then used as target practice and gun tests by RAF aircraft. Afterwards their badly damaged remains were simply left to rot. The wrecks have a very poignant feel today. The more southerly of the two is the slightly better preserved, and gives a real sense of the size and shape of the original vessel. It is difficult to imagine four men working underwater in the remarkably confined space of the hull. Four men, hardly enough space to put a German VIP into and transport them to Argentina. Bottom line. 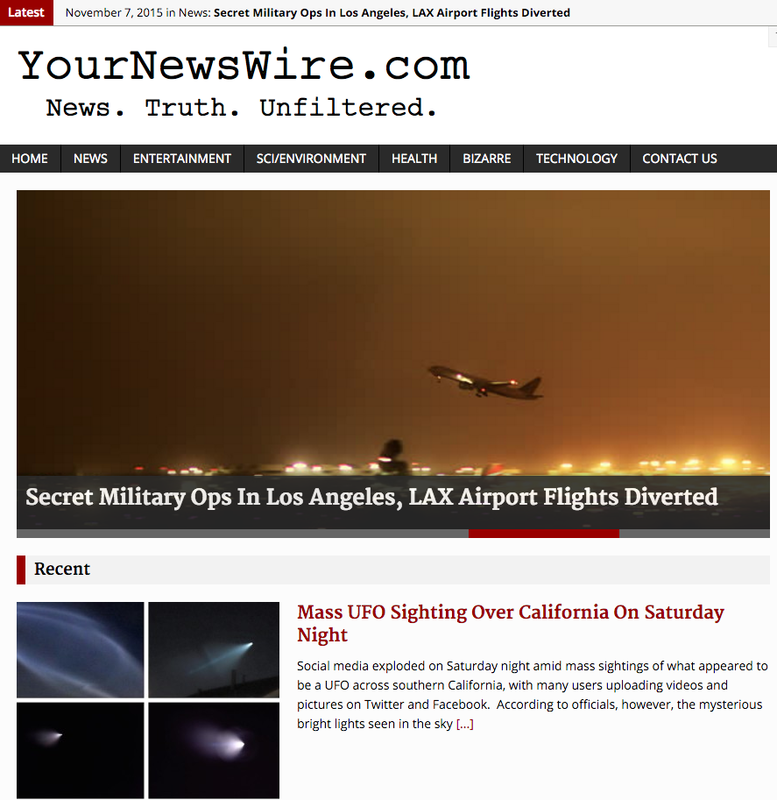 YourNewsWire is not a news site, in my opinion it is used by the Russians as a proxy site to spread disinformation. They throw in just enough legitimate news stories to establish a cover and when the opportunity to promote Russia, denigrate the West, or sow divisiveness against a Western country or alliance arises, they will publish Russian disinformation and misinformation through lies, fabrications and otherwise bogus stories made to look like news. Only this guy, Sean Adl-Tabatabai, who seems to write most of the “stories” at YourNewsWire, is lazy and cheap. Another Russian Proxy “News” site exposed. Liar. Cheat. Fraud. Well,well,well. For one crazy Russian BS site we can count a thousand similar US site. Just to remind you that the biggest worldwide propaganda minister is… Hollywood.